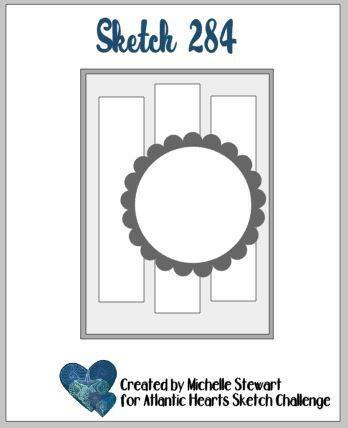 Once again we have a marvelous sketch for you to try over at Atlantic Hearts Sketch Challenge. 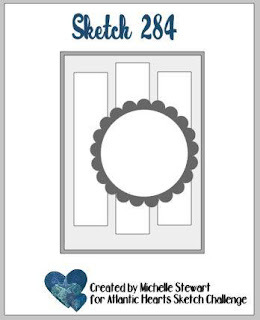 I find so much inspiration from a sketch, especially if my mojo is running a little on the low side!! Here's my card, and yes, it's a Christmas card!!! I can't stop using this gorgeous set, Wishing You Well. I love it so much I'm basing my October Card Class in the Mail around it!! Be on the lookout for this!! I stamped the wreath in Gray Granite ink and the bow is in Merry Merlot. Believe it or not, this self-proclaimed lazy stamper actually cut out the bow...by hand!!!!! Haha!! The paper comes from the Joyous Noel specialty designer series paper pack. Talk about gorgeous!! Love the copper highlights. Check out the rhinestones, I colored them with the Bronze Stampin' Blend...just the perfect touch. 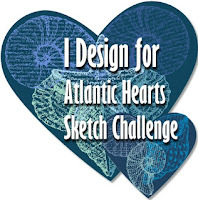 Now be sure to join us this week at the Atlantic Hearts Sketch Challenge, we'd love to see what you come up with!